Whipped this up while watching Serenity. 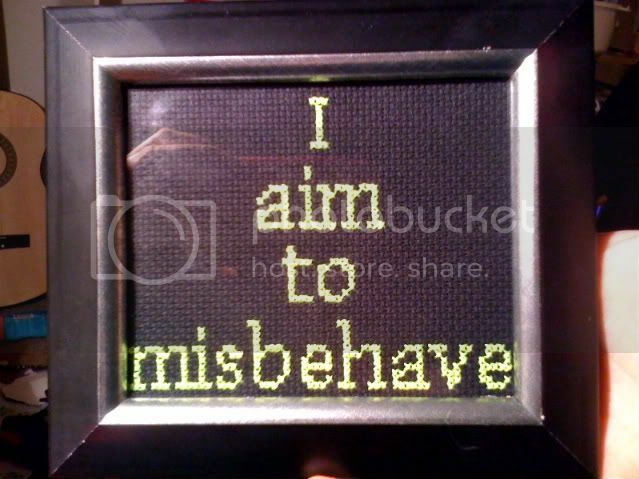 Think my next will be "No power in the 'verse can stop me" cos I love that film, and quotes are fun to stitch while my mind is to unsettled to concentrate on more complex things. Side note, I'm a fan of black aida, and I love the look of the fluro yellow thread on said black aida! I didn't realise the floss was so slippery though, it kept looping, separating and being generally crazy-thread. Doesn't help that my fingertips are as rough as guts currently and would catch on the strands all the time too, damn works cleaning chemicals!